After the sixth caution ended, it was the #10 WTR Dallara-Corvette with Ricky Taylor at the wheel which moved into the overall lead, chased hotly by Joao Barbosa in the #5 Action Express Coyote-Corvette and Tony Kanaan in the #02 Ganassi car, recovering from the time lost in the pits. 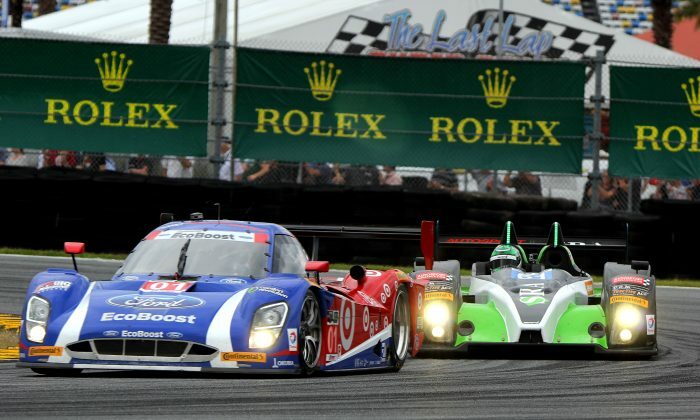 It was the GTLM battle which lit up the night—well, that and the fireworks display. The battle between Jan Magnussen in the #3 Corvette and Nick Tandy in the #9111 Porsche RSR as they fought through traffic, with Olivier Beretta in the #62 Risi Ferrari and Tom Milner in the #4 Corvette fighting just as hard to keep up. After a round of pit stops, Patrick Pilet in the #911 Porsche took the lead, but by lap 262 the Corvettes of Antonio Garcia and Tom Milner were within a second of each other. Three laps later Pilet and Garcia came up on slower traffic on the banking, and Pilet picked the wrong side—Garcia picked the clear path and got set up properly for the turn off the banking and made the pass. Alex Popow in the #8 Starworks Oreca retained the lead the team had taken when the #54 Core Autosport Oreca cut a tire and had to pit. The Core car, however, with Colin Braun behind the wheel, made up almost all the lost time and found itself second. Braun kept charging and by lap 265 the gap between the PC leaders was only four-tenths of a second, and a lap later made the pass on Popow coming through the Bus Stop. Riley Motorsports’ Vipers ruled in GTD, with Dominik Farnbacher in the #93 and Marc Goossens in the #33 running 15 seconds apart, with Shane van Gisbergen in the #22 AJP Porsche GT America a further 15 seconds back. At 8:38 into the race, (10:54 p.m. ET) the second-placed car, the #5 Action Express stalled on track (no fuel pressure) bringing out the seventh caution of the race.